DELAWARE, Ohio – Ohio Wesleyan University student Jemil Ahmed has earned an award from the Ohio Branch of the American Society for Microbiology for his research into how an extract from the spice turmeric may aid severely ill animals. 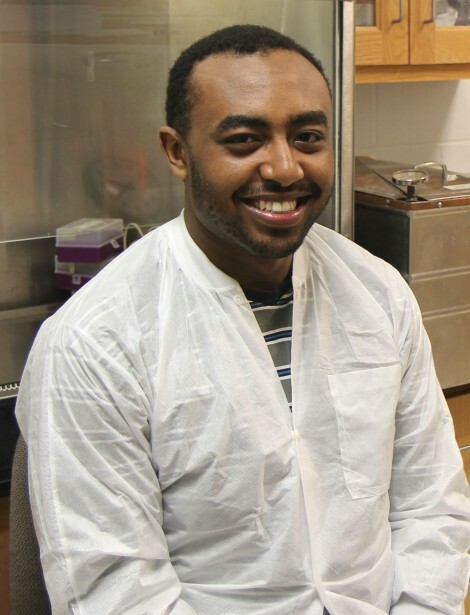 Ahmed, a junior biology major from Ethiopia, is working with OWU faculty mentor Suren Ambegaokar, Ph.D., to study how different concentrations of curcumin, an antioxidant found in turmeric, affects laboratory-maintained cell lines infected with vesicular stomatitis virus (VSV). The virus can cause severe illness in animals and livestock, including horses, cattle, and sheep. For his work, Ahmed has earned the 2016 Allan A. Ichida Undergraduate Research Excellence: Best Undergraduate Poster Award from the Ohio Branch of the American Society for Microbiology. The award was announced April 9 at The Procter and Gamble Co. headquarters in Mason, Ohio. The award is named in memory of Ichida, a 1953 Ohio Wesleyan alumnus and OWU botany professor from 1961 to 1995. Ichida also served as president of the Ohio Branch of the American Society for Microbiology. His water-quality research helped to secure “scenic river status” for the Olentangy River, located near the Ohio Wesleyan campus. The American Society for Microbiology, headquartered in Washington, D.C., is the largest life science membership organization in the world, with more than 39,000 members. Its mission is to advance the microbial sciences. Learn more at http://www.asm.org. Learn more about Ohio Wesleyan’s Department of Botany/Microbiology at www.owu.edu/bomi.